The European Union has committed to the long-term strategy of integration of the Balkan states of former Yugoslavia and Albania as its members. At the same time Belarus remains untouched by European integration. This means that the EU border remains a border dividing Europe. The rationale behind Western Balkan states' integration into the EU is geographical and geopolitical: the countries are already de-facto surrounded by the EU. Unlike Belarus, Ukraine and Moldova, there is no alternate integration pole for the Balkan countries. They are unlikely to establish a block among themselves nor join some third non-European integration project. Slovenia has been the first country of former Yugoslavia to join the EU in 2004. All other countries of the region have either applied for membership (with Croatia being in the vanguard of the process) or are at least officially considered candidates. This comes despite a history of deep internal problems and even recent civil wars, like Bosnia and Herzegovina or Serbia. Even Kosovo, which is not officially recognized by five EU member states, is considered a potential EU candidate. Belarus is effectively not at all part of the process of the European integration despite being culturally and historically probably even closer to Western Europe than some of the Balkan states. Belarus is economically stable (although badly reformed) and ethnically homogeneous, which is not the case with some of the Western Balkan countries. What Belarus and Northern Africa have in common The European Neighborhood Policy puts Belarus in the same row with countries of Northern Africa or the Middle East which radically contradicts the aspects of history and culture. The Eastern Partnership has been a step forward but its effectiveness is still questionable. Poland and the Republic of Lithuania are among the traditional advocates of Belarus' eventual integration with the EU given the countries' historical and cultural ties with Belarus and their unwillingness to be the union's border states. Until the 20th century there has hardly ever been a border between what are now Poland, the Lithuanian Republic and Belarus. Now the border between them is sometimes seen as a border between "Europe" and "Eurasia". 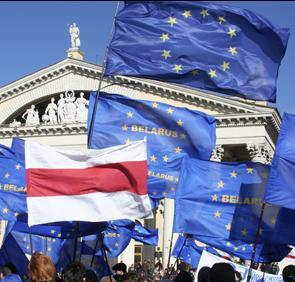 Opinion polls show that approximately half of the population of Belarus is in favour of the country's EU integration. Both the opposition and, since recently, the officials strive for Belarus' closer cooperation with the EU. At the end of the day, it is still a question to be discussed whether Belarus should indeed become a full member of the EU and expose itself to burdens of the Union's bureaucracy and over-regulation. But Belarus' formal joining of the European Union is not the issue itself. The problem is that the border of the EU is a border separating Belarus from the most of the continent and thus a border dividing Europe which is seemingly not the way it is being seen by the EU itself. The European Union and the public opinion there tends to identify the words Europe and EU, which is a mistake. European identity versus Realpolitik It is not only the fault of the authoritarian regime of Aliaksandr Lukashenka that Belarus is not quite regarded as a European country in the West. Spain, Greece and Portugal have had even more repressive regimes until the 1970s which has never crossed out them out of Europe. The democratic and increasingly westernized Georgia has in the last years showed strong adherence to values claimed to be European and commitment to European integration. Despite that, it is treated by the EU in virtually the same way as the undemocratic Belarus, with hardly any membership perspective foreseen. Some observers claim that relations with Russia are of higher priorities for the EU than relations with countries like Belarus or Gerorgia. Therefore Brussels would rather prefer leaving the countries in Russia's sphere of influence instead of responding to their desire for European integration. The post-Soviet integration and cooperation initiatives have an extremely unsuccessful track record. It seems that the problems persist. 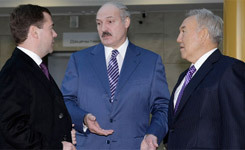 Recently, the very idea of Customs Union between Belarus, Russian Federation and Kazakhstan had been questioned, after the government of Belarus made clear its intent to insist on more tariffs exemptions, especially concerning Russian raw oil exported to Belarus. These exemptions are vital for the Belarusian economy which in 1990s and 2000s immensely profited on refining imported oil selling the end products to Western Europe. By importing cheap Russian oil Belarus kept its refineries in Navapolack and Mazyr busy and very profitable. It also worked well for Russia which lacks refineries and other processing facilities. But recently Moscow decided to stop this enrichment of Belarus and while insisting on 'customs union', excluded oil and oil products from its coverage. Belarus is expected to pay full tariffs. Yet cheap oil was that only benefit which made the idea of customs union with Russia and Kazakhstan, known as the world's major oil- and gas exporters, interesting for industrially developed Belarus. 'Customs Union' in its present shape, including two identically raw materials-based economies oriented at selling energy resources and buying consumer goods, does make sense. But only for these two economies, however. In essence it is merely a protectionist agreement. Siarhiej Chaly is sure, Belarus has no interest in entering such association. The Belarusian officials, including deputy prime minister Siamashka now express the same opinion ever more explicitly. Is Moscow facing one more failure in its attempts to collect its 'lost lands'? If Minsk will not comply with Russian wishes on the Customs Union it means a setback for ambitions harbored by a significant part of Russian elites, including Russian prime-minister Putin. Of course, the Kremlin can continue the whole enterprise with sole Kazakhstan. Yet, in this case Moscow shall wait until 2012 as agreed with Kazakhstan president Nazarbayev. More cooperative Lukashenka could be a symbolic geopolitical victory for the Russian leadership which is important to Russian public opinion eager to see restoration of 'national greatness'. Some observers speculate that such integration project could quite intentionally serve to show the wider audience in Russia an illusion of Soviet Union revival for the next presidential campaign of Vladimir Putin. Meanwhile, there are two other conclusions to be drawn from the Customs Union. First, the integration of Belarus and Russia and their so-called 'Union State' has been endlessly discussed and propagated in public and media, but it remains only a spin matter, since the countries did not even reach the level of customs union. Moreover, conditions of oil shipments to Belarus proposed by Russia this time are worse than those for China. Second, the whole set of post-Soviet integration initiatives so far have pitifully failed, and it is true both for projects with Russian involvement and without it. The reason seems to be common and basic lack of trust in relations between post-Soviet nations. Without confidence in their partners, former Soviet republics see all integration enterprises as either formalist nonsense or a way to promote other ends which run contrary to integration. The only examples of successful integration embracing post-Soviet countries are the EU and NATO. Even Baltic countries did not manage to get along well enough to abolish borders or create common currency between themselves until they joined European Union.